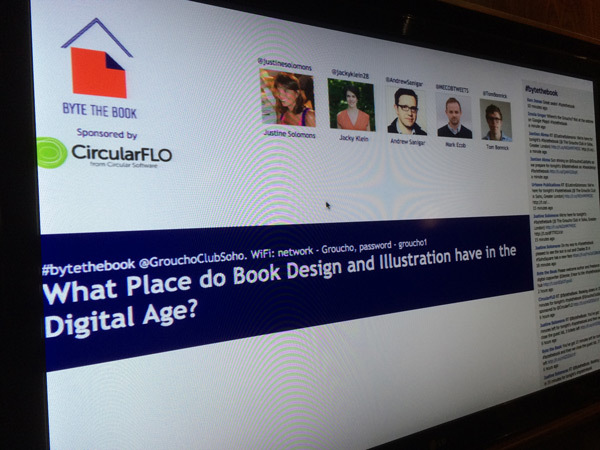 Byte the Book: What Place do Book Design and Illustration have in the Digital Age? 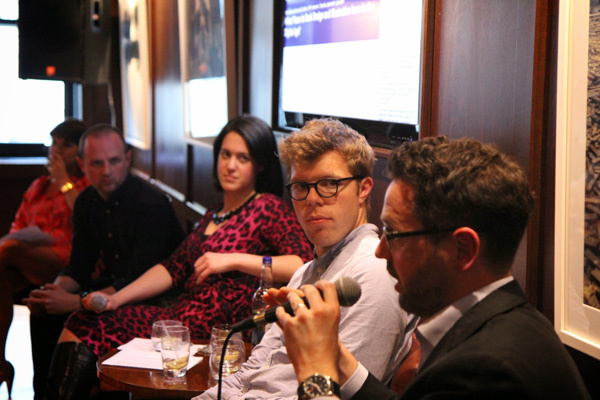 Chaired by Tate Publishing’s Jacky Klein, May 2015’s Byte the Book event at The Groucho Club (sponsored by CirciularFLO) discussed the role of book design in the digital age, with Andrew Sanigar (Commissioning Editor at Thames & Hudson), Tom Bonnick (Business Development Manager at Nosy Crow) and me, Mark from Mecob Design. 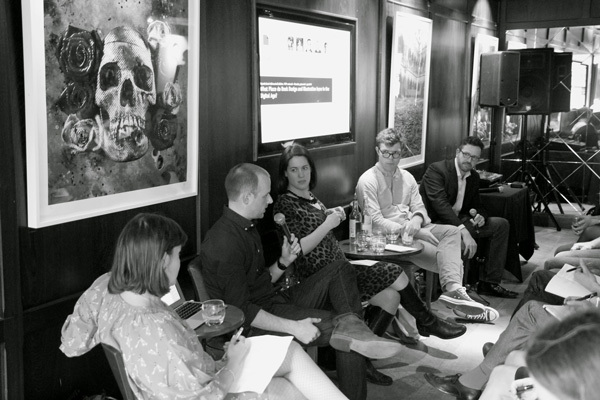 As a panel we discussed major questions about design and its importance when producing books on and offline. From simple things like ‘Do people judge a book by the cover, and is it more so for ebooks?’ to what the big issues in design are at the moment. Jacky expertly guided us through, and both Andrew and Tom made very relevant points in an engaging way. Most relevant for me was the importance of design no matter what the medium. We were lucky enough to look over examples from both Andrew’s and Tom’s companies, and receive questions for the audience about design and its role, but the overriding theme that design was innate to creating the right experience for your product on and offline. Whether it’s a coffee table tome or a child’s app, design is essential of matching your customer to your content effectively. We saw the design development of the Thames & Hudson Magnum contacts Sheets collectors edition, which made relevant points about keeping the design simple. The images Andrew brought along were beautiful, showing why T&H is still one of the best at producing this kind of huge, coffee table books worthy of a gallery book case. Tom brought some actual physical books along with some exciting app images on which we discussed user interface. During this no doubt engaging discussion, I got lost in Open Very Carefully by Nick Bromley and Nicola O’Byrne, published by Nosy Crow, a book about a crocodile who was trapped inside the story and wanted to eat his way out. It was absolutely enchanting. Alongside, Tom brought along Axel Scheffler’s Flip Flap Jungle, another gem. The audience were lucky enough to get these as prizes at the end. I brought along the Octavia E. Butler series design, beginning with Kindred and going on to the eight-eBook backlist. It was an example of how design and practicality can meet successfully in the face of varied subject matter, market and format, all on a controlled budget. I followed up by discussing The Hanging at Cinder Bottom by Glenn Taylor, which aimed to emphasise the role of the designer’s instinct, and when to question (or ignore in this case) a creative brief, and how to justify it. At the end of the evening we took questions from the audience on branding, client integrity, and then had the pleasure of networking with the Byte the Book crowd. I met some fantastic people and ran out of business cards. It was a fantastic evening, and I am humbled to have been asked to take part. If you haven’t heard of Bye the Book, take a look online and come to their next networking event. Run by the lovely Justine Solomons, the world’s most gifted networker and eminent Publishing Consultant, you’ll get a warm welcome and won’t be disappointed. 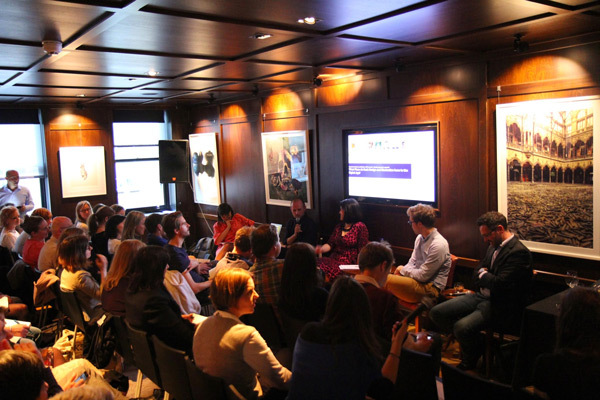 You can read the Byte the Book event report HERE.